I think a big part of what drives me to do so is shopping for fresh fruit and vegetables at local markets. When the new season produce is on the shelf I am like a kid in a candy store. The “ooh’s and aahs” flow freely from my lips. Often I am so excited that we end up with a glut of whichever ingredients happens to catch my eye. I decided to make something that used up lots of things that I had in my fridge that I wanted to finish off. So out came the yoghurt, the lemon curd and I grabbed one of the many lemons in my citrus bowl. While the best way to enjoy blueberries may be raw, they’re great used in all kinds of recipes and given my other ingredients I decided on a cake. 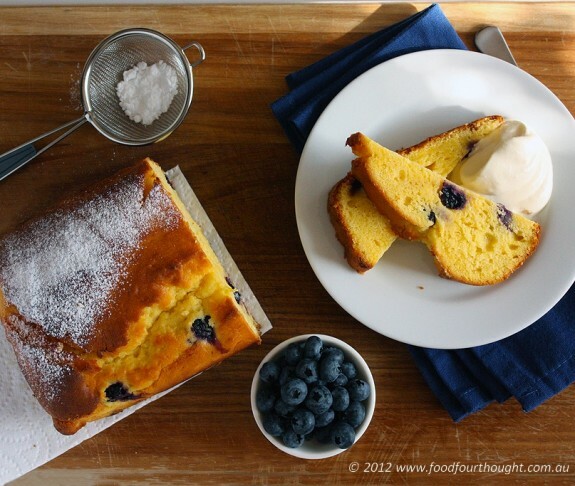 blueberry, lemon, yoghurt cake – (recipe by Fiona at Food 4 Thought). Preheat the oven to 170°C with the fan on (or 180°C for non fan-forced oven). Line and/or spray a x x x loaf pan. Add sugar and lemon rind to TM bowl and mill for 20 seconds on speed 10. Scrape down sides of bowl, add butter and mix for 15 seconds on speed 4. Add butterfly, mix for 1 minute on speed 3. With blade running on speed 3, add eggs one at a time then beat for 30 seconds. Add flour and lemon juice, mix for 10 seconds on speed 1. Add yoghurt and mix for 10 seconds on speed 2. Add lemon curd and blueberries, mix for 10 seconds on reverse, speed 1. Pour into prepared loaf tin and bake for 40 – 45 mins at 170C fan-forced oven. Check if cooked by testing middle of cake with a toothpick. If it comes out clean it is cooked. My tips: It is important not to overmix this batter and that is why I decided to do it in stages. This means that the ingredients are combined well without being overworked. 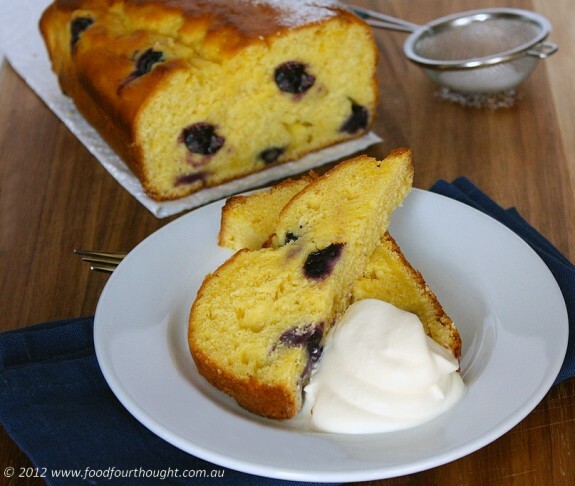 *This cake is extremely moist due to the yoghurt, lemon curd and blueberries. Ensure it is cooked in the centre and cool in the tin slightly before unveiling, cooling completely on a wire rack and serving with whipped cream. *You can use yoghurt and lemon curd that you make in the Thermomix. *Make sure you don’t overmix the cake. It is nice to have (kind 0f) ribbons of lemon curd throughout the mixture. cooking time: 45mins in the oven + cooling time. total: 50 minutes + cooling time. taste: 8.5/10. The lemon curd is like a soft ripple throughout the cake and the yoghurt gives it a tartness that I really like. would I make it again: Yes. Because I can use up things that I would otherwise throw out! And it happened to taste really good.